Front and rear airflow incident angles are designed in different directions. This cross bending fin technology produces cooling performance with minimum noise. 3 composite heat pipes and pure copper cross bending fins quickly cools down the heat from the CPU. Zalman's 'Compositd Heatpipe' features a 'Sintered Metal' type wick, resulting in outstanding capillary pumping performance. and a high thermal conductive design of 'Axial Greeves' which increases the heat transfer rate by 50% compared to ordinary heatpipes. 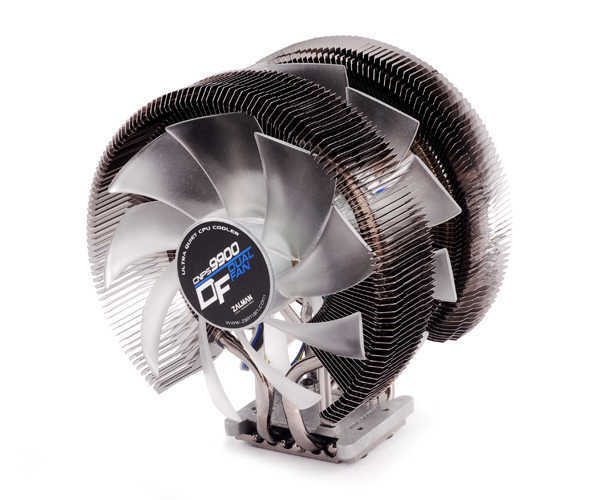 Cross Bending ultra quiet powerful 120mm Front Fan and 140mm Center Fan produces top performance. Zalman`s unique sanding process provides excellent heat transfer ability. With height 160mm and width 180mm it fits in a variety of cases including mid case. Compatible with Intel Socket LGA 2011, AMD Socket FM2, FM1 and most Intel, AMD platform. High performance ZM-STG2 helps to maximize the heat transfer from CPU to CNPS9900DF base allowing optimal cooling performance.